The sound of WWII fighters, bombers and trainers flying over my house can only mean one thing, It's AirVenture time again! Living 20 minutes south of Oshkosh is pretty nice this time of year. 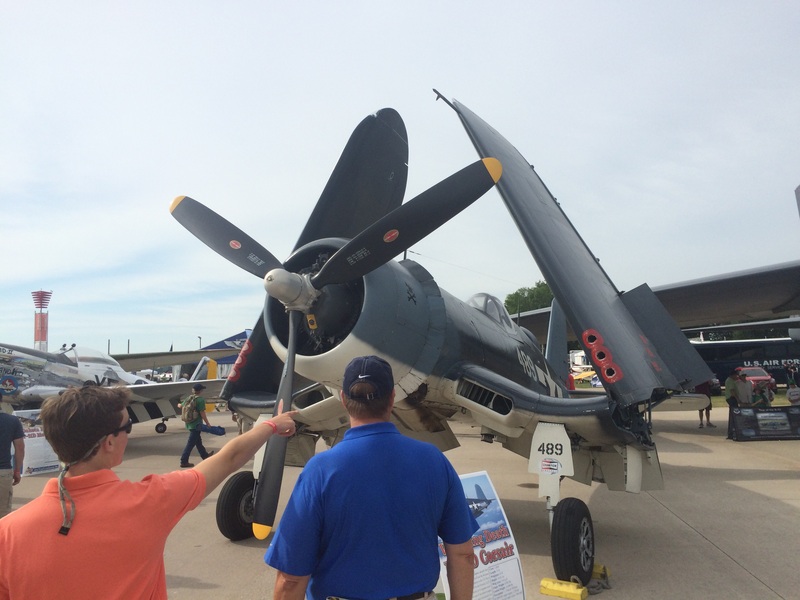 Anyone on the forums going to Oshkosh for AirVenture 2015? I wish! I'm hoping to make it next year, hoping a ride in my cousin's plane. I'll be camping on-site. I forgot about Airventure and then last night it dawned on me, "wait, isn't Airventure in a few days?!?" *looks it up* wait, it starts tomorrow?!!???! Luckily I have a 4 day weekend this week. (Thurs-Sun off) It would be a shame if I don't go one of those days. I don't exactly have the finances to go, but it would be a shame to live so close but miss it two years in a row. I'm working there during the week, and the awesomeness is already there. The north 40 is almost full, and a lot of the warbirds are arriving today. Nobody has a valid excuse to miss this year! On my way to work today I saw a homebuilt plane fly too low and too fast over Black Earth, WI. Honestly at first I thought it was a large scale RC plane, even though it had lights. I was thinking, oh great, some joker is ruining our hobby... oh wait that's a full scale plane ruining a different hobby. And on my way home from work (at 11pm) I saw a couple of planes headed north over Madison, WI. Those were going slow enough to definitely be piston powered planes. One appeared to be following the other, but not closely. Point is, there is definitely more air traffic over Wisconsin. I hope to go Thursday. I'm still mad at myself for missing last year but I was sick. Not way too sick to go, but just sick enough for it not to be worth it. Thursday should be a pretty good day. The airshow schedule for that day looks good and all of the planes will probably be there by then. My plan is to go there Thursday and maybe also Friday. I'm most excited to see Burt Rutan's Ski Gull and the seaplane base. Planning to be there with a buddy of mine on Thursday. My father-in-law will be there most of the week as a volunteer. I'll be rocking a Flite Test shirt and hat when I go. Last year, a couple of people recognized the Flite Test logo and said they were fans. I'll be there tonight to take my youngest daughter to see the Dierks Bentley concert. Keegan and I (and maybe the rest of the family) will be there all day Saturday, as well as the Saturday night air show. "Presentation on SkiGull, his newest design, 1 p.m. Wednesday July 22 at the Honda Pavilion"
I read a news article about the Airventure Cup and I actually think the fast plane I saw over Black Earth yesterday was one of the 66 planes racing. There at least for sure was a plane that looked just like the one I saw in the race. I will be there on Thursday and Friday. It is my first time at Airventure so I am pretty cranked about going. My wife will be with me the first day and maybe the second. Growing up around the airlines and always loving planes I have wanted to go since the first time I heard about it. Been living in WI over 20 years and never been. It's about dang time. If anyone would like to meet we should exchange some numbers so we can text and meet up. Mine is 6085763560. I may be alone Friday as my wife is not sure she is going to enjoy it. However she absolutely loved the Heavy Bombers weekend in Madison last weekend. We went on Friday and she is still talking about it...who knows...maybe she will like Oshkosh too. I don't have a flitetest shirt but I will be on the look out for people with them on and will stop and say hi if I see one on someone. Isn't there an RC area at Airventure? There is. It's by the Kid's section. I forget specifically what it's called. Basically, when you get there, assuming you're entering through the museum, you can take a school bus to the main area, or you can walk over to the kiddie section. I recommend going straight to the kiddie section while you're near it and check out the small RC area. Then take a bus to the main area and enjoy the rest of the day among the full scale stuff. I don't want to say that the RC area is not worth checking out, but it's not big or impressive especially compared to everything else. Ordered my tickets for Airventure last night. Since it sounds as if a few of you guys have been before I have a questions. I checked out a few of the 2015 highlights from the website. On the airshow I see people sitting in chairs. Can you bring in your own chairs. My wife read you are limited to a small sized backpack. Just curious if I should just do a blanket or chairs. I haven't been to an airshow since I was a kid....it's been toooooo long. I saw a storch in the RC section last night! I'll be in the Gulf Coast Avionics booth in hangar C from 9-3, and in either the red barn or the north 40 grocery from 4-10. Cool. If I get to those areas how will I find you. Should I just ask for AkimboGlueGuns? My impression was that Airventure is pretty open to people bringing in anything. They do have camping there. I know a lot of people do bring in chairs for the air show. I never have because I didn't want to lug the chair around all day. For the air show I just sit on the grass. It's not the best on the back, but personally I'd rather be semi uncomfortable during the airshow than have to lug a chair around all day. I probably shouldn't be attempting to answer the question since I never tried to bring anything in. But I think I saw people bring in wheeled coolers without any issue. *thinks* Actually I think if you bring something they'll quickly search it. I remember seeing a line of people getting their back packs searched. But I do know those foldable chairs are fine. So, I guess the SkiGull did not make an appearance. I gathered from the article I read that Burt Rutan gave a briefing but the plane was not ready in time. So far, the most information I've received was from the FT Podcast that interviewed him. If I'm wrong, let me know. I took some pics for those who might want to go.